I can make that, myself…or can I? The same slacks, without the jacket, later the same day, makes a more casual outfit. 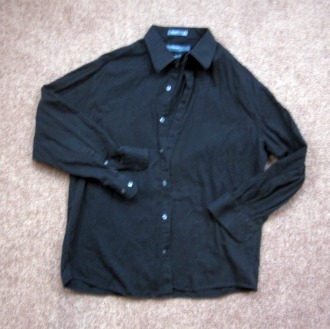 The shirt is one I re-fashioned from a men’s button shirt. I can’t find the original blog post I first saw this on, but another blogger inspired the “wear it backwards” detail–I cut off the sleeves, put darts in the (old) back of the shirt, now the front, cut out a new neckline, and turned a stuffy shirt into a fun summery top. These are wonderful pieces to have for travel or just a busy life! I have been sewing more capsules, as I need things that will do double duty in my small closet.